Police last evening detained a labourer from Enterprise, East Coast Demerara, whose wooden home went up in flames, hours after he was seen chasing his wife with a cutlass. Unconfirmed reports said that Rajendra Deonarine also known as “Jack” and “Deportee”, locked his wife and two children in the home yesterday afternoon during a fit of rage. They managed to escape after being threatened. A report was made to the Vigilance Police Station. 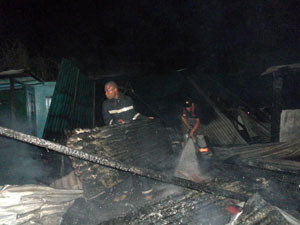 Firemen at the scene after the blaze had been extinguished last evening. While the wife and the two kids were nowhere to be seen when Kaieteur News arrived shortly after 20:30 hours, neighbours said that they were constantly being abused by the labourer who “smokes”. The children were said be a boy, around 8 years old, and his sister, said to be six. The parents are said to be in their 30s. A fire engine from Enmore sugar estate and another from Georgetown both rushed to the scene at 525 Fernandes Street, Enterprise, shortly after receiving reports around 19:00 hours. The man, police sources said, had been deported over 10 years now. Up to late last night he was being questioned about the fire which he denied any knowledge of. “De neighbours scared to do anything. Everyday is a scene. We see he running she with cutlass today,” one neighbour said. According to another, the man would constantly argue with his wife for money to support his “smoking” habit. The two-storey home, located at an end lot, was said to be made of wood and there was not much that neighbours or the firefighters could have done. According to a senior fireman, it was too early to tell whether arson was involved.